INSTANTBLEND is the perfect companion for coffee. Our unique formula gives this liquid non-dairy creamer a rich, top-quality taste and texture that enhances the flavor of coffee and also gives it the beautiful golden color people crave. With INSTANTBLEND however, you can use about half as much as you would milk and still get the color results you’re looking for. (It is ideal as a milk replacement when cooking, too.) 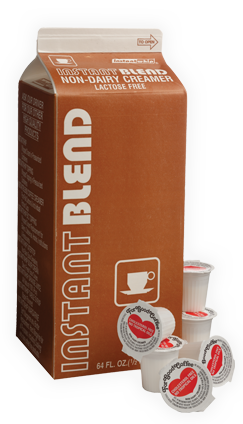 INSTANTBLEND has a longer shelf life than milk, half & half or light cream. And it is also available in portion control cups for carry out, room service, or for placing directly on the table. Ordering INSTANTWHIP® INSTANTBLEND from your local Route Sales Team, online or with a phone call couldn’t be easier.